In this photo made from the footage taken from Russian Defense Ministry official web site on Oct. 1, 2015 a bomb explosion is seen in Syria. Russia said that its warplanes bombed a terrorist stronghold and other terror targets in northern Syria on Saturday and that it would continue its push against Islamic State extremists despite Western claims that the aerial campaign is largely targeting Western-backed rebels. Russian Defense Ministry spokesman Lt. Gen. Andrei Kartapolov, speaking to Russian reporters, described "panic and desertion among [Islamic State] ranks" and said "nearly 600 mercenaries" were fleeing the northern town of Raqqa. "We will not only continue strikes ... we will also increase their intensity," Kartapolov said in comments quoted by Russia's RIA news agency. The United States and its allies have condemned the days-old Russian air campaign, claiming that Moscow is using the offensive as a cover to buttress the government of embattled Syrian President Bashar al-Assad. In the latest Western critique, Britain's defense chief said only 5 percent of Russia's airstrikes had targeted IS extremists, with most of the Russian bombs instead aimed at rebel groups seeking to oust Assad. "We're analyzing where the strikes are going every morning," British Defense Secretary Michael Fallon said in an interview with the Sun newspaper. "The vast majority are not against IS at all. "Our evidence indicates they are dropping unguided munitions in civilian areas, killing civilians, and they are dropping them against Free Syrian forces fighting Assad," Fallon added. "He [Russian President Vladimir Putin] is shoring up Assad and perpetuating the suffering." Kartapolov also said Saturday that Russian warplanes had conducted more than 60 flights in the past 72 hours, targeting more than 50 Islamic State facilities. "All the targets were destroyed quickly, irrespective of weather conditions and time of day," he said. 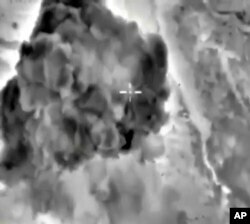 In this photo made from the footage taken from Russian Defense Ministry official web site on Oct. 3, 2015 a bomb explosion is seen in Syria. The ministry also posted YouTube videos of the strikes, which it said were carried out using SU-34 and SU-24M fighter jets. On Friday, President Barack Obama insisted the conflict was not going to become a "proxy war" between Washington and Moscow, even as the two countries conduct airstrikes on different groups inside Syria. "This is not some superpower chessboard contest," Obama said at a White House news conference. At the same time, he was critical of Russia's military engagement in Syria, calling it a "recipe for disaster." "[Putin] had to go into Syria not out of strength, but out of weakness because his client [Assad] was crumbling and it was insufficient for him [Putin] to send him arms and money. Now, he's got to put in his own planes and his own pilots," he said. Obama noted that the Russians do not distinguish between Islamic State militants "and a moderate Sunni opposition that wants to see Assad go. From their perspective, they're all terrorists." The president said this lack of distinction would have consequences for the Syria that emerges from the conflict, because the moderates will be needed to help run the country. Obama said the U.S. would continue its current policies of attacking Islamic State, supporting Syrian moderates and working with the Turks along the border — and above all, seeking a political solution, which he said would “not be easy” but was “still possible." A U.S.-led coalition on Friday urged Moscow to halt any attacks on the Syrian opposition and focus on Islamic State targets. "These military actions constitute a further escalation and will only fuel more extremism and radicalization," said the coalition statement, posted on the Turkish Foreign Ministry's website. The coalition that includes U.S., Britain, Turkey, France, Germany, Qatar and Saudi Arabia has been carrying out airstrikes against IS targets for about a year. In a comment clearly aimed at the coalition airstrikes, Syrian Foreign Minister Walid al-Moualem told the U.N. General Assembly in New York on Friday that airstrikes "are useless unless they are conducted in cooperation with the Syrian army, the only force in Syria that is combating terrorism." Putin, French President Francois Hollande and German Chancellor Angela Merkel discussed Syria during a peace summit on Ukraine Friday. 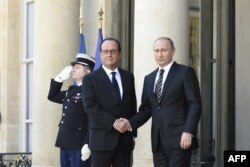 Hollande said afterward that he told Putin Russian airstrikes must target Islamic State and only Islamic State. French President Francois Hollande (L) shakes hands with Russian President Vladimir Putin upon his arrival at the Elysee Palace, on Oct. 2, 2015, for a peace summit on the Ukraine conflict. In his speech Friday at the U.N., Moualem said that his government would participate in U.N. working groups to reach a peace deal, but that it could not implement democratic reforms related to elections or the constitution while "fighting terrorism."